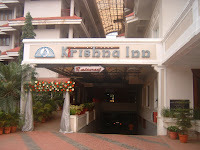 We stayed at the Krishna Inn, which is not much visible from the main road. 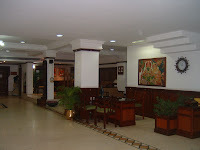 It plays host to the Who’s Who of Kerala and South India, whenever these people visit the temple. Left to myself, I would have preferred an ordinary place, closer to the temple. But we were guests and sometimes when the host offers regal fare on a platter you just can’t refuse, can you? 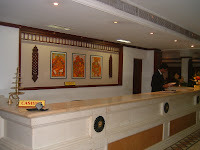 I took pictures of the reception are and the foyer late night. 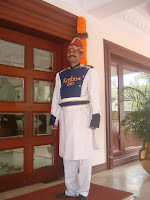 The attendant at the doorway was always all smiles and I couldn’t resist the temptation one morning. 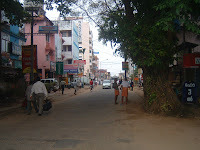 The last shot is of a view of the East Nada Street running towards the main entrance to the temple from the road outside the hotel.